Finding funding for your entrepreneurial endeavour is not as straight forward as it would seem. While you might initially think that as soon as you have established a product/market fit the venture capitalists will come calling, nothing is further from the truth. With startup companies around the globe clamouring for venture capital investment, today's investors can cherry pick, your startup idea might not make the cut. Fear not though, as venture capital is not your only hope. In fact, accepting a venture capital investment might not even be in your best interest. 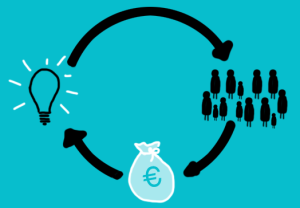 You might instead want to consider opting for equity crowdfunding instead. There are numerous crowdfunding platforms you can consider. Following are just a few options you can consider before you sign a term sheet from a venture capitalist. Seedrs offers a platform that lets entrepreneurs raise funding for their ventures from a variety of sources. Investments on the Seedrs platform can come from family and friends, business associates, or community members. If your entrepreneurial idea is a consumer or retail product, you might want to take a look at CircleUp as a potential funding opportunity. CircleUp connects verified investors with product startups in need of funding. Whether you're launching a food truck concept or a new beverage, you can get your product in front of potential investors who might be considering adding a consumer product startup to their investment portfolio. You can raise a little bit of funding from numerous investors instead of accepting a lump sum investment from one venture capital firm. Crowdcube lets startup founders pitch potential investors for funding. Similar to the way Kickstarter or Indiegogo raise funding for products, Crowdcube lets entrepreneurs solicit funding. Business proposals can be in a wide variety of sectors including manufacturing, retail, and tourism. Explore Crowdcube's platform details to see whether you might want to consider funding your venture via the crowd. Currently active in Israel, Our Crowd will soon allow investors to pool their resources into global startups around the world. Our Crowd combines the best parts of venture capital and angel investing into a unique crowdfunding platform. Review the specifics of their offering to see if Our Crowd might be a good fit for your entrepreneurial idea. If your startup company already has a strong legion of supporters, you might want to investigate Alphaworks as a possible funding source. Alphaworks helps startups with strong community support to connect with accredited investors. Community supporters are able to invest alongside traditional angel investors. Review the funding details of Alphaworks to see if their platform might work for your funding needs. These are just five of numerous funding options you can consider. Understanding that accepting venture capital is not your only choice is crucial if you want to build a successful company and maintain control of your business. While venture capital is the right choice for some businesses (especially if you want to scale on a global level), it is not necessarily the wisest choice for all entrepreneurs. Knowing what your alternatives are is extremely important, especially if you are getting to the negotiation stage with potential funding partners.